In vivo DT-MRI is challenging because the motion of the heart and respiration influence the parameters of diffusion tensor imaging, and the most of in vivo DT-MRI is performed under breath-hold. The purpose of this study was to evaluate the feasibility of in vivo DT-MRI without breath-hold with regard to changes in direction-dependent water diffusivity reflecting alterations in tissue integrity such as apparent diffusion coefficients (ADC), fractional anisotropy (FA), and fiber length. Acute myocardial infarction (AMI) was induced by ligation of mid segment of left anterior descending coronary artery (LAD) in sixteen pigs. 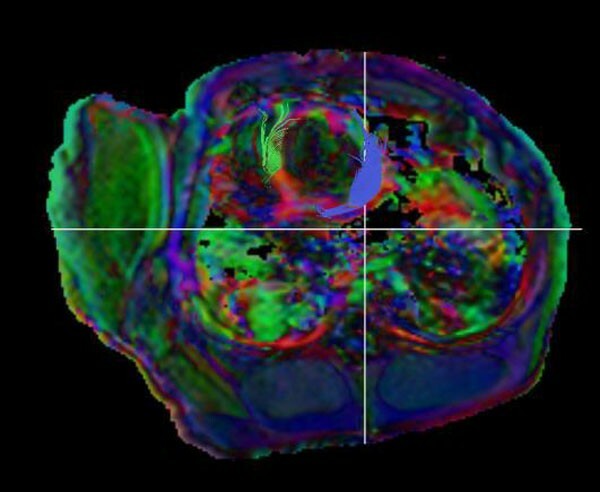 DT-MRI using a SENSE-based echo-planar imaging technique was acquired using a 1.5-tesla MR scanner with free-breathing state using navigator sequence. With a b-value of 300 s/mm2, the diffusion tensor images were obtained for 6 diffusion-sensitizing gradient directions at infarcted zone at the mid-ventricular level. Image quality of the acquired DTI was evaluated using a 3-grade system; good, fair, and poor. The ADC, FA, and the fiber length were measured for quantitative analysis. The difference of parameters of DT-MRI was evaluated using Wilcoxon signed rank test. Intraobserver agreement of ADC and FA was evaluated using Bland-Altman plots. In vivo DT-MRI's of post-infarct myocardium with fair or good image quality can be acquired and the results correlated well with those of ex-vivo and breath-hold studies in the literature. This technique may help one understand structural correlates of functional remodeling after infarction especially in the patients who cannot hold one's breath. This work was supported by the National Research Foundation of Korea(NRF) Grant funded by the Korean Government.